Not quite clued up on ANTHEM? Well you're in luck, because the game's just dropped an in-depth new trailer that covers a number components present in the upcoming release. From the basics of the story to character progression, it's well worth a watch if you're undecided on whether BioWare's latest is for you. ANTHEM's due out on PlayStation 4 in just over a month, but there are a couple of playable demos launching before then. The first hits on the 25th January but requires a pre-order of the game, while the second is available to all, and releases on the 1st February. 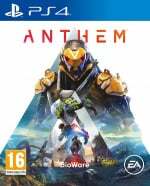 Are you up for ANTHEM? Fly directly into the comments section below. I pre-ordered today. I might be blinded by my love of BioWare but I really feel like they are going to bring their A game after Andromeda. I can't make up my mind about this one.First I was interested,then I lost interest but after seeing more of it I've become VERY interested!Will definitely be giving the demo a go. Waiting for reviews before committing, but it certainly looks interesting. Yeah the more we see of it the more I'm warming to ANTHEM. Will definitely give the demo a go. Technically, it looks pretty cool. I hope it’s a good experience to play as a single-player game as well. I have very little interest in this but I’ll give the demo a go, BioWare deserve a chance based on their earlier games. EA's shilling this one pretty hard, i'm getting the impression there isn't as much hype/enthusiasm for it as the publisher would ideally like. I wonder if Ubisoft is keeping a close eye on this one. Though thematically very different, they are both in the loot based, third-person shooter/rpg genre. They could theoretically lose some sales to each other as they release so close. shopto is offering this on pre-order for £32 on PS4. bit of a desperate step to boost pre-order numbers?. @PS_Nation Same here man, hoping the story is still a big part but if it's another Destiny clone, not interested. @KidBoruto Me too dear, I tried Destiny 2 because of PS Plus and it wasn’t for me, it’s not a great game to play on single-player. @PS_Nation Online only single player games have always rubbed me the wrong way, dunno why.